- Improve your ability to locate electric system faults. - Manage data in a single accessible system. - Monitor and control switchgear remotely. - Respond quickly to service outages and restore power. The Model 561-16 transceiver is used on a pair of multidropped fiber for all remote devices, such as RTUs, Programmable Logic Controllers (PLCs), IEDs, etc. You can arrange the transceivers in a loop or bus (radial) topology, which allows you the flexibility to greatly expand your system in the future. 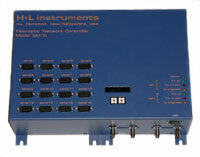 The Model 561-16, used as a master unit, is the head end for the SCADA masters. All signals pass through the controller, which can automatically "self-heal" the system and re-route data in the event of fiber cuts or a transceiver failure anywhere in the system. The arrangement of transceivers in a loop configuration provides a highly reliable, fault-tolerant solution. FiberLoop II, in small systems, can provide a dedicated channel for each RTU. In the FiberLoop II system, if a SCADA master needs to be at another location (e.g., a water plant master is typically in a different location than the electric department control center), then you can install serial port jumpers at the 561- 16 network controller to bridge two virtual channels and remotely bridge that remote master on one virtual channel to another virtual channel that broadcasts to all units. You can place Model 561-16 transceivers in the system as standby controllers at any location connected to a standby SCADA master computer, which allows them to take over the FiberLoop II operation in case the primary controller fails. You can add as many as 250 additional Model 561- 16 transceivers to the system and, depending on the model, you can connect up to 4, 8, or 16 RTUs or other IEDs to each one (32 devices can be multi-dropped on the optional RS-485 port). With 16 virtual channels, the Model 561-16 is flexible enough to meet your most rigorous data communication needs.